Cities’ energy efficiency and use of resources. However, we seldom ask: What is population density and are we measuring it correctly? With the support of my employer, MRCagney, I’ve just written a short working paper that looks at this issue: Population-weighted densities in New Zealand and Australian cities: A new comparative dataset. It can be read in full here (pdf) and comes with an interactive spreadsheet that allows easy comparisons between cities. This paper presents a new, more robust measure of density: population-weighted density. In contrast to simple average density measures, which basically measure the number of people living in the average hectare of land in the city (which is generally found in a low-density fringe suburb), this measure estimates the density of the neighbourhood in which the city’s average resident lives. As a result, this measure is much more representative of the lived experience of a city’s residents. The US Census Bureau has used a similar approach in their recent population density profiles. As a result, Auckland is now the third-densest city in Australasia – behind Sydney (76 people/hectare) and Melbourne (45 people/hectare) but significantly ahead of Wellington (38 people/hectare), Perth (30 people/hectare), and Brisbane (34 people/hectare). There is no geographic reason why good public transport will not work in Auckland. 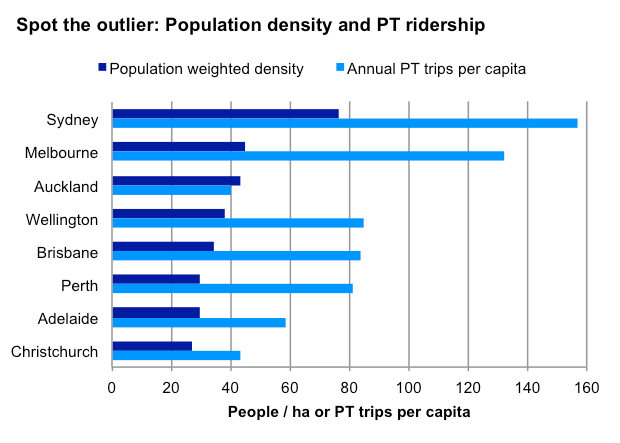 Cities that are less dense than Auckland have successful, high-patronage PT systems. 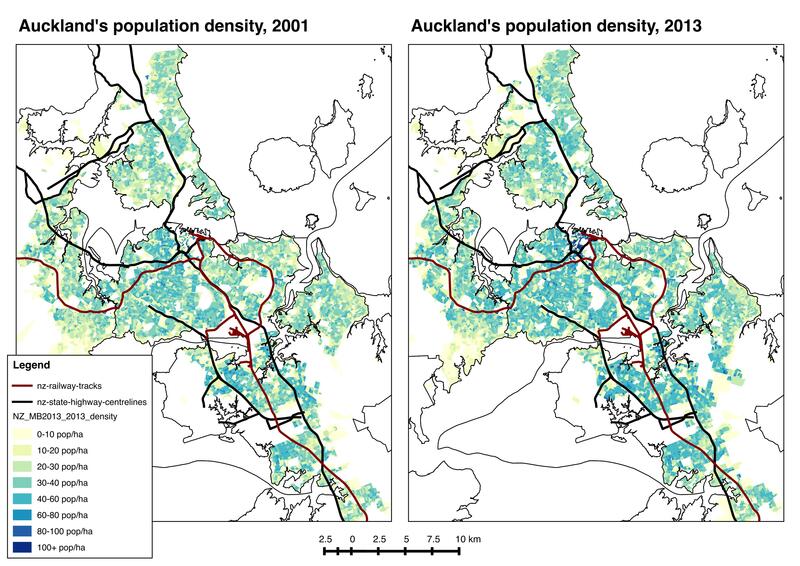 Here are maps of Auckland’s population density in 2001 and 2013. As you can see, the city’s gotten incrementally denser throughout its entire area – look at the slightly darker shades of blue appearing all over the isthmus, on the North Shore, in the West and in Manukau. 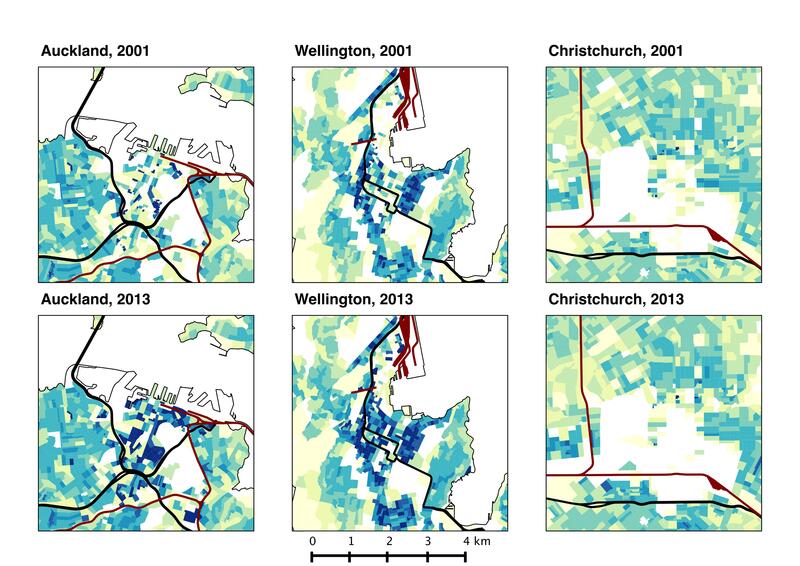 If we zoom into centres of New Zealand’s three largest cities, we can see that there have been big changes in city centre density in both Auckland and Wellington. Christchurch, on the other hand, as suffered from the effects of the 2011 Canterbury Earthquake, which demolished much of the city centre and reversed the city’s tentative moves towards apartment living. In spite of rapid demographic transition in Auckland’s city centre, rising density hasn’t really spilled over to surrounding suburbs. Comparisons between cities also provide some interesting insights. 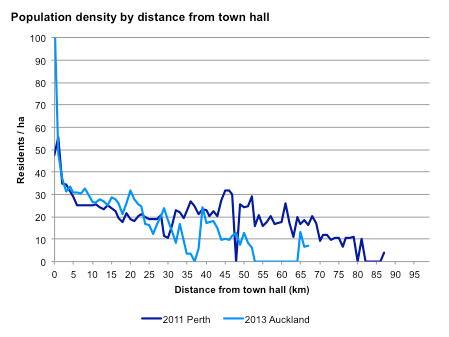 The following chart, from the interactive spreadsheet, compares population density profiles in Perth and Auckland. Perth has frequently been cited as an example for Auckland due to the success of its electrified rail network, which now carries over 60 million annual boardings. However, Perth’s less dense, and significantly more sprawling, than Auckland. Clearly, low density isn’t holding back Auckland’s PT system. The following chart makes that point even more clearly. It shows population-weighted densities and annual public transport ridership in eight large Australasian cities. Although Auckland is the third-densest city, it’s got the lowest PT boardings per capita. In short, Auckland is in an especially good position to benefit from a virtuous cycle in its transport system. Recent increases in density throughout the urbanised area have contributed to rising ridership on public transport, strengthening the case for further investment in projects like the City Rail Link, the AMETI busway, and the city’s New Network. Delivering a better public transport system will, in turn, encourage further land use change. If you’re interested in this topic, take a look at the working paper and the interactive spreadsheet. What do you think about Auckland’s changing urban form? That population density and PT ridership chart is striking. I wonder how things have changed for each city now. I’m enjoying the weekend tour through some of my old posts! Thanks Matt! Heidi: I think Auckland’s up to 50-55 PT trips per capita these days, while Christchurch has (sadly) dropped to around 35. Other cities haven’t changed that much. Thanks, Peter. In your interactive spreadsheet, I’m looking at the change in population vs distance from town centre graph. Yet another graphical way to show the inner suburbs haven’t pulled their weight in addressing the housing shortage.